Hello everyone and welcome back to yet another diving blog for Sairee Cottage Diving, Koh Tao. This time I will be talking about some of the many benefits of snorkeling that we often forget after learning to dive. Since becoming a Dive Master, with Sairee Cottage Diving over four years ago, I have not done a lot of snorkeling. It seemed silly to splash around on the surface after putting so much time and effort in to becoming a professional diver and not take advantage of It at every possible opportunity. Ever since the first time I did a try dive in Byron Bay Australia I knew that diving was going to take over the rest of my life and snorkeling could only ever tease me, just showing the tiniest fraction of what is beneath the waves. I felt even stronger about this after I became interested in underwater film and photography and found that bobbing along the surface was a real challenge to get steady footage or level shots. This all changed last week when a couple of my best friends came back to Koh Tao for a month long holiday. With them only having a short stay we had to get as much done as we could in the time they had with us. We spent one of the days at shark bay in the hope of finding and getting some shots of the black tip reef sharks. 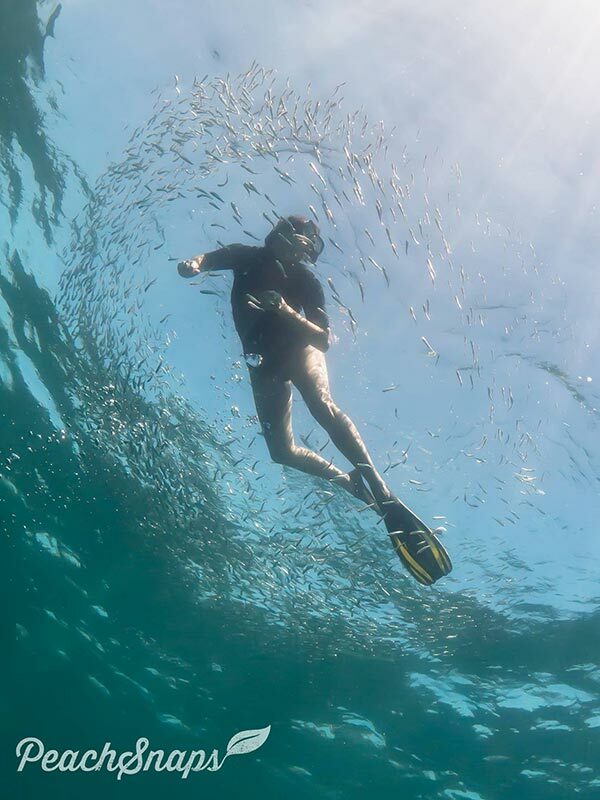 There is very little chance of seeing them while diving around Koh Tao as the sound of the bubbles scares them away. Unfortunately, we didn’t see any sharks but we did see a few things I have never seen whilst diving and some of it up very close. One of the most exciting parts of the snorkel was when we were surrounded by tiny Bait Fish. They appeared out of nowhere and in an instant we were surrounded by hundreds of them circling us. Before long we had Needle Fish and Trevally watching us from a distance. Every time they came in closer the Bait Fish would start swimming faster and create an even tighter ball around us. 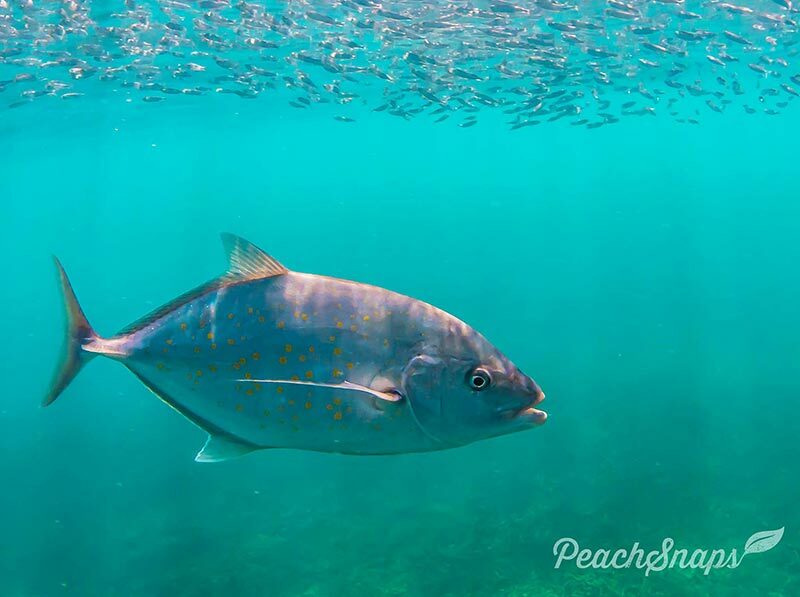 We then noticed that any time we would duck dive to get photos or a closer look at the reef the Trevally and Needle Fish would charge at the Bait ball with such force that they would leap out the water. It was very exciting to watch even if the Trevally did get a bit carried away and crash into us a few times. Another great experience we had was spending a long time with one of the biggest Green Turtles I have ever seen. We were lucky enough to watch it feeding and gently swimming around the site for about 30mins. Something else that we got to see that you normally wouldn’t be able witness while diving was the turtle breaching for air. This gives a chance for a rare intimate photo opportunity as well as another chance to practice split level shots, whereby the camera lens is half in and half out the water, and some reflection shots. Although I still and always will prefer diving, snorkeling does let us see certain things we would normally miss or be unsafe to experience with SCUBA. In total, we were out on the reef for about 2 hours with no worries of air running low or decompression sickness. I now have a few ideas for snorkeling shots I want but I will be sticking primarily to scuba diving…. Lets face it is way cooler.